Hannah with snowman just her size. “It’s not snow man snow” my daughter kept saying. 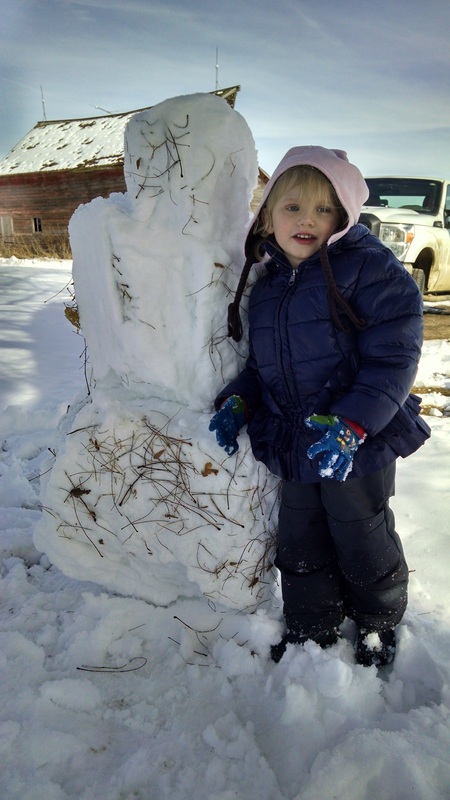 Well this weekend it finally melted enough to make a snowman family (ended up building 4 snowmen on Sunday). With the snow and the nice/ bitter cycle to the weather this winter, I got curious as to what’s happening with the frost line. Last spring when we installed some of our moisture probes we did it in a way that let us leave them in all year long. Not only do we not have to worry about getting them out ahead of the combine and the rush of getting them all in after the planter goes past, but storage is also no longer an issue. Since, we have the Acclima probes in the ground all year long, they take readings all year, and one of those readings is soil temp. Boy, was I in for a shock when I checked the our real-time telemetry reading from AgSense AquaTrac. A week ago, we had readings below freezing at 18” while 26”, 34” were still 2-4 degrees above freezing. This week 18” is just above freezing and the lower depths are only 1-3 degrees from freezing. With temps of 34.7 deg F at 34 inches (down 1.5 deg in 4 days), I’m a little concerned about waterlines this winter. The most surprising information from the soil probe was the trend in soil moisture. There was a hard drop in soil moisture when the soil froze. While that may or may not be a shock to some what happened next definitely was. The soil below the frost started to lose moisture after being stable for a considerable time. When the frost went out at 18” the soil moisture was actually higher than before it froze. A soil scientist explained it to me this way. The frozen soil acts like a desiccate. That is, it draws soil moisture upwards. While this sounds bizarre that’s exactly what we saw in our data. Hopefully the warm weather this week will help bring those deep temps up some. In either case take advantage of the nice weather.